At a recent event I had the joy of reintroducing Kindergarten activities to a group of educators. It was a simple project, really. With magazines, calendars, and books (yes, BOOKS) in hand, these very serious adults took on the task of cutting and ripping and tearing pieces in order to create a new piece of artwork. The fancy term, of course, is remix. It is a buzzword of this digital literacy age we’re in, and really an important way of thinking critically and imaginatively. Dr. Donna Alvermann and UGA doctoral candidate Crystal Beach set the stage for this particular presentation two years ago with their Becoming 3lectric project that set out to study remix in the digital space. The three of us collaborated on this event and presented together. The energy in the room resonated with laughter and chatter – just as it should for a group of adults exploring their inner children. They shared their creations and admired each others’ work and the stories that accompanied them. The leftovers. I was in the process of cleaning the room for the next session coming in, but her question stopped me cold. Maybe it was the moment, but I suddenly thought, not so much about the leftover materials, but about the leftovers. The materials, after all, were outdated and used things that were already bound for the refuse bin, so the paper scraps and bits were not the actual issue, at least not in my mind. No, what struck me was that, in my enthusiasm for a hands-on fun learning experience, I neglected to fully engage a whole segment of the audience: those who are uncomfortable with the messiness of learning unless they understand the rational behind it. Most people are game to try new things if they know why it matters. Some people don’t need to know why before they jump in with total abandon. And others, like myself, enjoy the process of constructing meaning from the exercise that makes sense with our own points of view. Most of the people who chose to attend this session fit one of these three categories, but there was a under-represented fourth group that deserved a better answer that I was unprepared to give. So, why do this project and how does it fit into the real world of the English Language Arts classroom? I think one reason is the connections we make between others who wander the planet with us. When we remix work done by others into something new, we insert our lives into theirs and we become co-constructors of meaning and relationship even though the players may never meet. What do we know based on this interaction? Maybe knowing is in the experience of mingling our thoughts with the ideas of others. Dewey wrote about the experimental practice of knowing and certainly remix is active experiment. 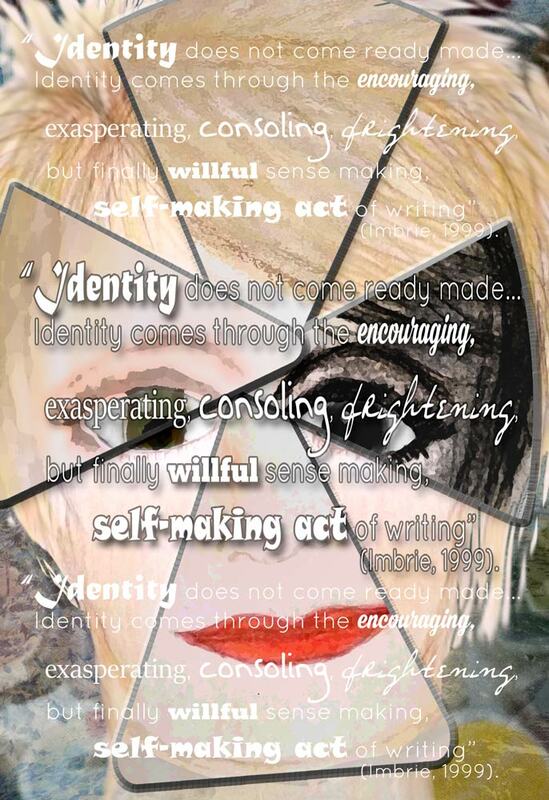 What do we learn about ourselves, our identities, and maybe our insecurities through a process of remix? Are we making a statement that perhaps our version of other people’s work is superior? Or do we unveil our own uncertainties about our own contributions to the dialogue around us? This is a discussion worth having, particularly as paradigms about education and knowing shift under our feet. Once education focused on survival skills and community support. It was practical, ensuring students could read and write enough to be considered literate, and to be able to function sufficiently in mathematics to be a contributor to a local economy. More recently the standardized multiple choice test became the dominant measure of knowing something. This policy, long criticized by classroom teachers, now faces refinement and no one is quite sure yet what the next step will look like. But educators still hold to the heart of their passion: teaching students, not to take tests, but to survive and thrive in a rapidly changing world. Remix may not change the world, but it can change a child in a classroom who is given the freedom and opportunity to explore him/herself by interacting with the words and art of those who have gone before. And that’s why it matters. Not just because it’s fun, but because the opportunity for reflection and connection creates meaning between generations and people and cultures. Because, while there may be students who know who they are and don’t mind messy exploration, there are others who identify more with the leftover scraps than the whole pieces. 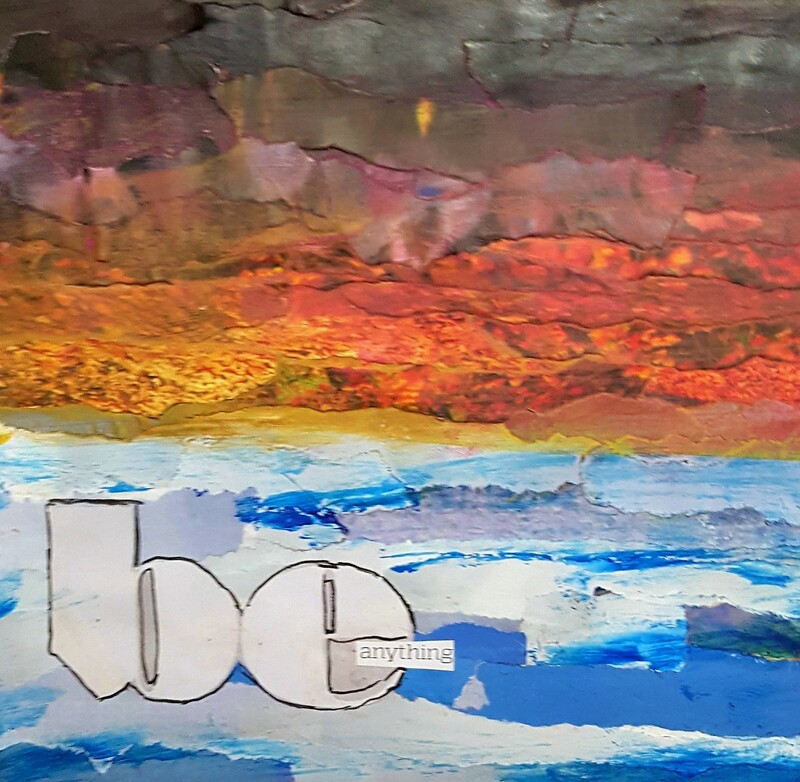 I created this piece with the same scraps that had so bewildered our participant. The purpose may not always be obvious, but it is present. There are no leftovers; only beauty waiting to be discovered. Dewey, J. (1984). The play of ideas. In J.A. Boydston (Ed. ), John Dewey, the later works. Volume 4: 1929, The quest for certainty. Carbondale and Edwardsville, IL: Southern Illinois University Press. It’s really Simon Ensor’s fault. In a Google Hangout during a conference, Simon asked someone to define “virtual buddy.” He asked the question again on Twitter. He followed that with a blog post. And then he wrote a poem about belonging. And so I started thinking. These “between” spaces were supposed to be a sort of “third space” for collaborative discussion about the keynote speakers at the conference. As they evolved they became a sort of debriefing for participants while the online participants (from all over the world) became sort of eavesdroppers who gleaned whatever information came through the on site players. It made me feel both connected and disconnected at the same time. When the on site players shared a single computer their conversation was often between themselves as they developed tactile relationships while the rest of us watched. When they returned to conference activities, those of us left in the Hangout tried to make sense of the information and even found ways to create our own “mini-sessions” of informal collaboration. While I had connected with many of the participants (both on site and online) before this conference, Simon’s question made me consider the reality of those relationships beyond the words shared on the screen. In a reflective post about Rhizo15, Dave Cormier discusses the challenges of creating a structured community in an unstructured idea (rhizomatic learning is by nature without formal structure). How can individuals belong to a community without creating a division between “we” and “them”; in this case those who had been around since the first experiment (Rhizo14) and the newbies who were just figuring out the concept? Dave writes far more eloquently than I about the conflict between Instructivism and Constructivism, but it all goes back to Simon’s original query: What exactly is a virtual buddy? I have playing on the digital playground long enough that I no longer consciously differentiate between local acquaintances and those whom I have only met online. 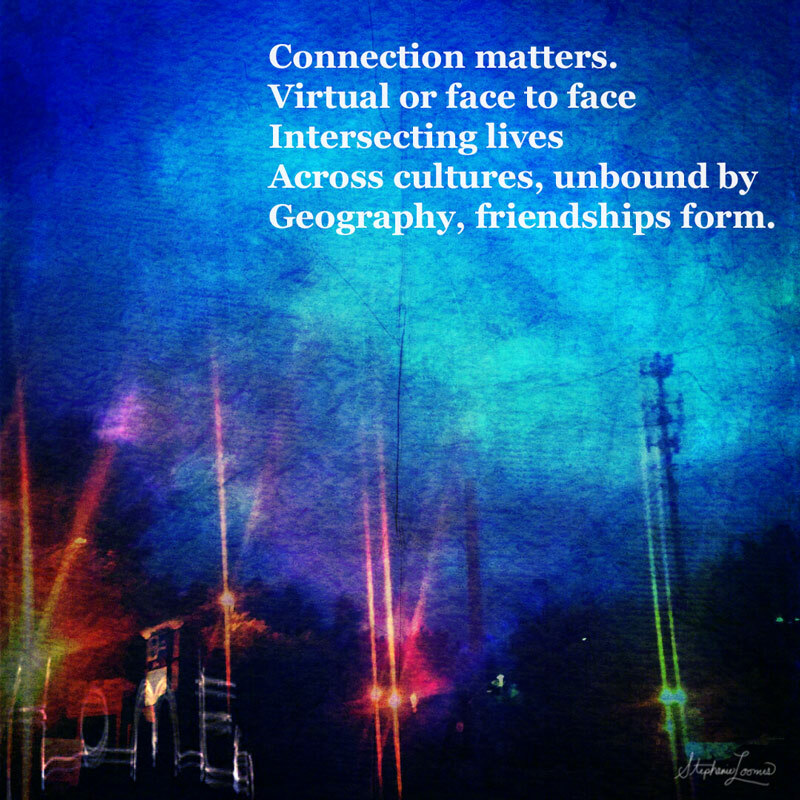 In many ways, I often feel MORE connected to those virtual friends because we have to make an effort to connect across time zones, geography, and cultural barriers. Underneath that, however is a common interest in how to harness the power of the internet to make education both accessible and relevant to as many people as want it. Along the way we discover other common interests: knitting, photography, Doctor Who, and other facets of life that have nothing whatever to do with education. So are these friends “real”? And if they are, why is there a disconnect when some of them are together in a place while others of us connect from our own individual spaces? This whole new world of digital relationships and collaborations is messy. But then, new things are often messy. And not always “right”, especially at the beginning. …America ain’t cemented and plastered yet. They’re still building it. That’s why a man with ink in his veins not only still can but sometimes has still got to keep on moving around in it, keeping moving around and listening and looking and learning. That’s why ignorant unschooled fellows like you and me not only have a chance to write, they must write…it won’t ever be quite right, but there is always next time; there’s always more ink and paper and something else to try to understand and tell. And that probably wont be exactly right either, but then there is a next time to that one , too. Because tomorrow’s America is going to be something different, something more and new to watch and listen to and try to understand; and, even if you can’t understand, believe. And there is the answer. Online relationships won’t ever feel “quite right”, but we must keep trying new ways to connect and eventually we will see something “different…more and new” that, even if we don’t fully understand, we can believe. In its imperfections, there is still connection. Perhaps the best part of being “virtual buddies” is the journey we are taking together into something unexpected. *All the acronyms are confusing, but much of the hybrid pedagogy/virtual connections take place on Twitter with extensions to Facebook and/or Google Plus. All of the things in which I participated were forms of MOOCs (massive open online courses) geared toward educators who wanted to explore and promote the idea of open learning. Rhizo is based on the idea of the rhizome plant, one that sends out new growth from its roots so that the visible growth is supported by an underground structure that is interconnected. Dave Cormier is probably the leading expert in the current iteration and his ideas on the purpose of education need more thought that I intend for this particular post. DigPed is attached to the Hybrid Pedagogy journal. The Connected Learning MOOC (#clmooc) was a six-week course for educators organized mostly by professionals connected to Youth Voices. All of the hashtags are still active on Twitter. Meriwether, J. B. ed. (2004), William Faulkner: Essays, speeches, & public letters. New York, NY: Modern Library. Random House, Inc. This week’s Make challenge had me stymied. The premise revolved around game design: creating, remixing, and redesigning games and gaming systems. My first thought was that I know next to nothing about video games, and although I understand the appeal (not to mention my baby brother is a lead audio director for Treyarch), I don’t play them myself. I’ve read James Paul Gee’s work enough to recognize the potential of video games as part of project based learning, but it is beyond the scope of my experience. Then I realized that “games” did not have to mean video games. I thought of board games and tried to think of new ways to remix them for my ELA classroom. My own creativity fell short, but several people came up with brilliant ideas that I may just have to steal. Margaret Simon (@MargaretGSimon) tweaked “Apples to Apples” so that players have to use random words to create stories. Deanna Mascle composed an adorable poem from old board game names and created a Muse game that may help collapse writer’s block. My favorite may be Julianne Harmatz’s “Capture the Quote“, which morphs Uno into a close reading tool. Brilliant. Still, my own creative process stumbled over the “game” concept. I didn’t play a lot of games as a child and I generally wasn’t very good at them when I did. As I re-read the definitions of “game” #clmooc participants had tossed around, it suddenly hit me. I didn’t play traditional games as a child, it’s true, but I did play. I read voraciously, and the books stimulated an already active imagination so that my play became play acting. It should be no surprise that I spent several active years in community theater and my first teaching job was in Theater Arts. How many of us didn’t take on imaginary roles on our play? Pirates and princesses, aliens and androids: these dress up characters take on lives when we apply imagination. The premise of my “game” is imagination. 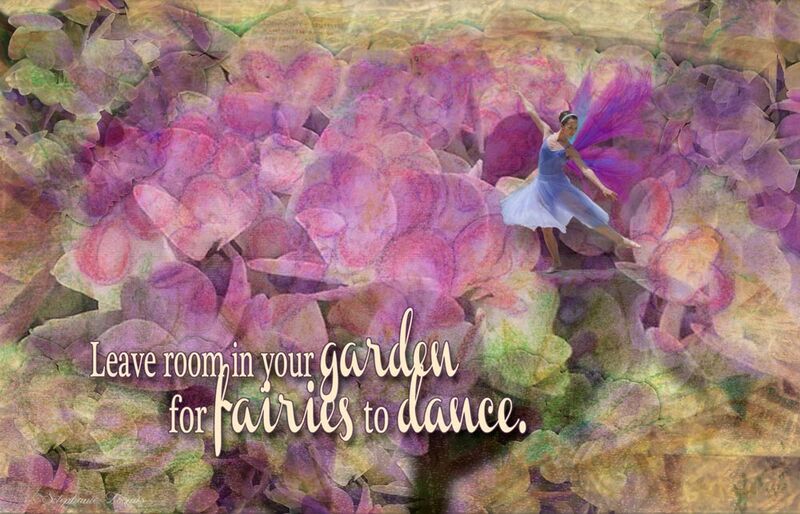 I grew up with my imaginary friends, most of whom were fairies who lived in the giant pink flowers of my wallpaper. (It was the 70s, what can I say?) However, my imaginary world and my books took me to fantastical places beyond looking glasses, through wardrobes, and beyond time. As for using this particular exercise in the classroom, I think it could be a way for students who “do school” to break out of the academic model for a moment and write or create for the pure joy of expression. It could begin with a question about childhood games and how they affect the growing up process. Who we are is largely determined by who we once were, so it is a legitimate thought for reflection. I’m still exploring this idea of “games” and I think I may be onto something useful. I love hydrangeas. When I visited Savannah at the beginning of June, I took dozens of pictures from every angle and of every color I could find. 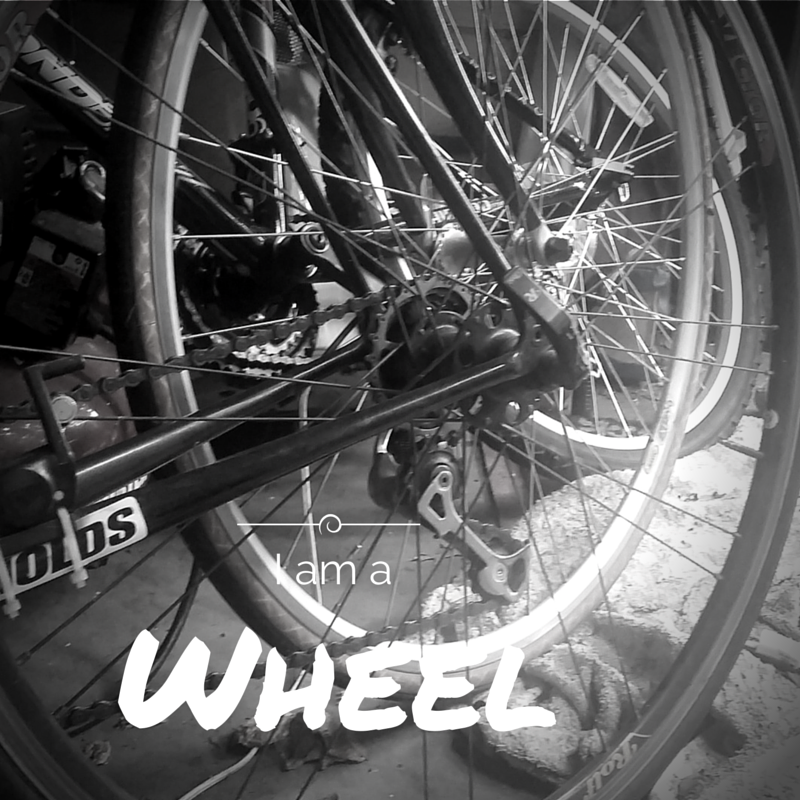 It made sense to begin this project, RE(MEDIA)TE, with a personal photo of something I love. Why hydrangeas? I think it is because they can change with the acidity (or aluminum) in the soil. High pH leads to pink blossoms, while a lower pH produces blue blooms. The whole range of color, from rich red to deep purple is all dependent on the acid in the soil. The plant adapts to the changes in the soil, and a plant that is naturally pink can be made blue by manipulating the circumstances of the growing environment. People have a harder time adapting to change. 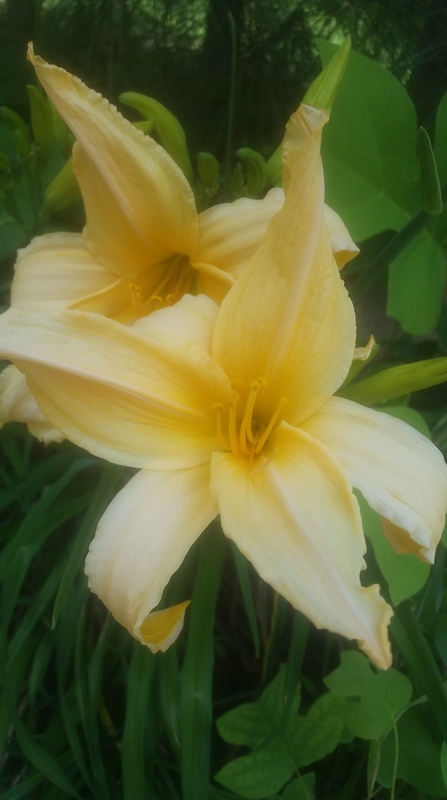 Many shrivel up when things get hard, while others refuse to bloom at all unless conditions are just right. What if we, as educators, can teach our students how to “remediate” their responses to the challenges they face in life, whether or not it is academic. Certainly no one can predict how the future will unfold, and it is rare to live very long without some unexpected change. What if we can use our classrooms as adaptive spaces, where students can find their identities and understand that flexibility will keep them moving forward when the hard times come? In fact, it is the challenges that make us more beautiful, even though the outcome is nothing we could have anticipated. Like hydrangeas, the acid/alkaline balance of life’s circumstantial soil does change us. If we can anticipate that change, perhaps we can welcome it and appreciate its loveliness. And if we can pass that message to our students, perhaps we reach beyond our content area to real-world learning. My re(media)tion began with a photo. Good photos require an attention to aperture and shutter speed, light and shadow, as well as composition. As I changed media and took to colored pencils, I had to consider shape and color in different ways. Shapes were something that photography captured for me. The image as colored pencil drawing is not realistic. That is a decision I made as a creator, based largely on my skill set. There are other artists whose techniques create drawings that rival photography in detail and accuracy. Neither is better than the other; it’s a decision each artist makes in order to capture the image in his/her mind. Or it is a decision based on constraints of technical ability or available tools. Once I was satisfied with my drawing, I scanned it in order to re(media)ate to a form I am comfortable with and that I enjoy tremendously. I find digital art such a freeing form. I am a pretty good photographer and a mediocre sketch artist, but Photoshop Elements lets my imagination run free without the hindrances of a lack of ability or training. This is an important consideration for our students. Some will be gifted writers. Other will excel in various art forms or physical accomplishments. When we consider re(media)tion, we must consider that each student will come with his own set of abilities and challenges. When we meet students at their comfort levels first, we are then able to guide them to new ideas, new experiences, and walk them through the art of becoming. They may only identify as athletes or an artists or a mathematicians, but we can teach them to embrace new ways of expression and in the process, help them develop a new skill. I used a variety of digital techniques to manipulate my original image. I started by scanning the colored pencil drawing so I could pull it into Photoshop Elements (PSE). Someday I’d like to move up to the whole Creative Suite, but for now, PSE does everything I need. And what it doesn’t do, I can usually figure out a way around it. That’s another good life lesson for our students. Sometimes the way you think you’re going to accomplish something requires a change of plans and some creative rigging. Back to techniques. I used several art filters: high pass, watercolor, darken image, and a few others. I changed blending modes and ended up with a nice foundation. Then I added some textures, mostly my own creations, but one from a company call Design Cuts that has some really fun effects, textures, and overlays. That was artistic enough, but fantasy/imagination is an important part of remix. I have a former student who is a ballerina and my favorite model. 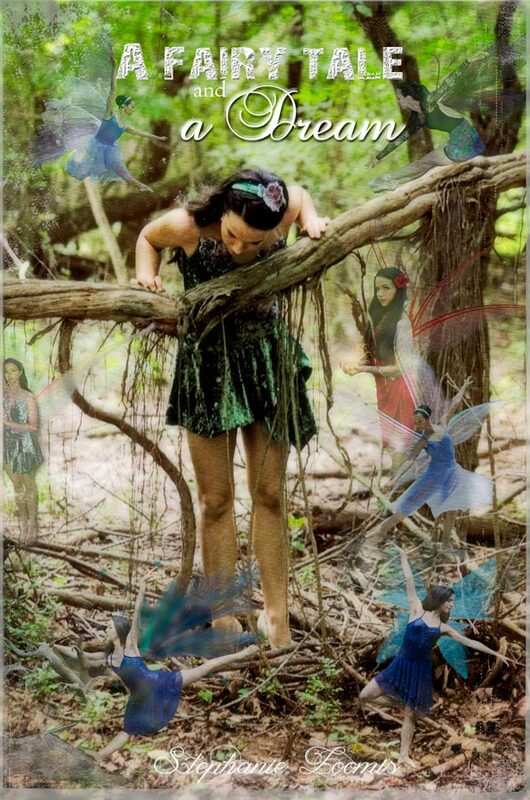 I had wanted to do a fairy themed set of digital art pieces, and I knew she would be game to play along. We ended up doing a whole series of photos that I am currently turning into Elemental Sprites: Air, Fire, Water, and Earth. It’s great fun for me, and she loves the end result. I remembered one of the photos from the shoot taken in an outdoor location that allowed me to easily extract her. I added some wings from Deviant Art (once I changed the colors to work with my theme.) Then it was a matter of placing her in a place that made sense. And isn’t that also true of life? If we are haphazard with where we place our trust or our skills, we may find ourselves in precarious places. We must think through life’s decisions, and the sooner we can help our students see that, the better prepared they will be for a world where they are in control of all their decisions. I finally added a quote to finish the piece. I looked for the source, but couldn’t find it. Still, it fit the scheme of the artwork, so different from the original photo, yet still totally me. I think that’s one message of re(media)tion: freedom in creation expands the mind and allows the self to continue on a journey of becoming. In the #clmooc conversations on Twitter the other night, the idea of inclusivity was tossed around. How do educators ensure that everyone has the ability to participate in online activities? Do we exclude some from participation? Can connected learning be fully realized without complete engagement? Connected learning by its very definition requires some ability to access the internet. There was a time when this constraint was difficult to overcome, but today, most people, especially those in developed countries, have access via smart phone, tablet, or computer. There are exceptions, of course, particularly in rural areas and in places where a number of circumstances slow the process, but the hardware issue is increasingly resolved, and will continue to improve as costs go down. In that sense, more and more people are able to be included. The social part of connected learning is possibly the easiest to access. A Pew research study found that in the US, 74% of online adults actively use social media. I suspect those numbers will continue to rise as the next generations reach adulthood, as 95% of US teens are on social networking sites. Educators must learn ways to harness that connectivity for more than social interactions, but the social is a good place to begin. Twitter and Instagram (and SnapChat) seem to be the biggest players in the current teen market (based solely on my observation as a parent and teacher of teens), while Facebook is increasingly relegated to the “old people” (anyone over about 25). SnapChat’s limitations seems to preclude education applications, but there may be a creative way to utilize its popularity. Twitter and Instagram hold more promise. So, connection is not the primary issue. Engagement is the greater challenge. Of course, that’s true in the face-to-face classroom as well, but distance seems to create a boundary or buffer that is more difficult to break through. While a smile or nod may encourage a reluctant student in a brick-and-mortar classroom, the same cannot be said of the virtual realm. In order to be truly connected, everyone has to fully engage and participate. So, how do we educators avoid excluding people who are already connected? Some form of exclusion is inevitable: language barriers, time zones, type of media (Twitter? Google+? Instagram? ), expectations (real or imagined), and miscommunication. Some exclusive elements can be thwarted with creative thinking and commitment to communication, but some cannot. What does one do with a student who CHOOSES exclusion? How can we provide a new community atmosphere in a relative void? How do we structure or scaffold this idea of connected learning to students (along with parents, other teachers, and administrators) who are new to the concept? This is where I believe the “social” part of social media affords an opportunity. Since so many people, both teens and adults, are already using social media to connect their non-academic lives, we who promote connected learning need to begin with a social structure. Gee’s “affinity spaces” certain offer a place to begin. I think this is why I’m drawn to unique ideas like the “untroductions“. They may reveal personal and social commonalities that can then be built on to create a learning environment that inspires creative production in a collaborative community. I can’t count the number of Doctor Who fans I have met around the world through various Twitter communities and learning events. That bond, as superficial as it may be, can become the foundation for something greater: new stories for the TARDIS, what it means to be “bigger on the inside” or even an exploration of the science involved in space-time travel. (I just read The Martian by Andy Weir – talk about geeky science meeting literary nerd! I loved it.) Finding the element of common interest is a beginning. A safe place may be the most important. Even in the most free-flowing community there must be boundaries for appropriate behavior, speech, and respect. A good facilitator must be able to quietly minimize both awkwardness and poor judgement. The community must welcome all who choose to participate as long as those participants are willing to maintain mutual respect, edification, and support. These communities must not become places where bullying is permitted on any level. Everyone should be welcomed for whatever they bring to the table. There is no distinction between ages, genders, religion, politics, or whatever else may create a divide. The mission of the community must be clear–and clearly communicated. Within that, however, there must be freedom of expression, creativity, unusual ideas, and multimodal forms. The idea of becoming community means that everyone has something of value to contribute, and everyone can learn. When the educator abandons the role of expert and becomes a member of the community who has much to learn, even the most insecure participant may be encouraged. I opened this rambling post with a picture of a bridge. 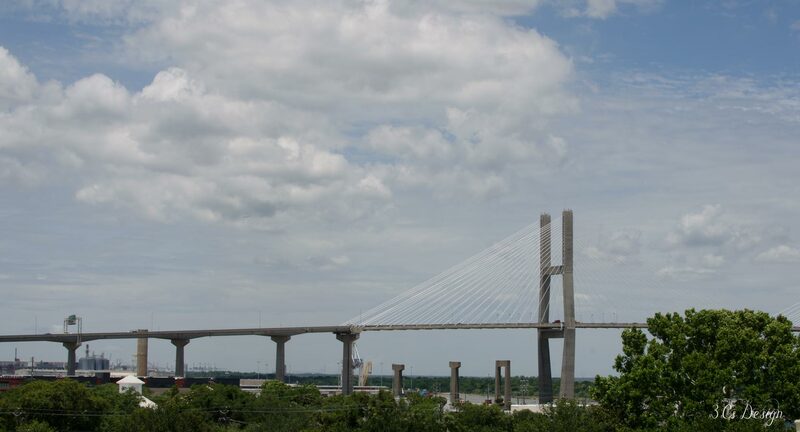 The internet is like that bridge, connecting people and ideas that are otherwise separated by insurmountable challenges of time and place. Most people can get to the bridge one way or another, but unless they begin the journey across, they will never connect to the adventures on the other side. And who wants to miss out on that?